On our honeymoon, my husband and I went to a resort with two sections: clothed and 'au naturel.' We didn't pay much attention to this 'feature' in our pre-vaca research, yet when we arrived, did a double-take upon seeing naked people (not the sculpted bods you'd think may lounge around in the buck) in the distance and remembered what we'd read. It didn't bother us, in fact, we admired their freedom. If the people from the other side of the resort wanted to vacation naked, so what. We were all clothed at night for dinner and nobody knew what side you were from anyway. Converts I failed to mention above that we opted for the "clothed" side of the resort, although I'm sure the our honeymoon may have been a little more spicy had we stayed on the naked side. Enter "Jim" and "Joanne" (names changed for purposes of this article), also on their honeymoon. Jim and Joanne were originally slated to stay at a Couples Resort in Jamaica, but something went awry upon check-in, so they moved over to our resort (the former Grand Lido Negril). The only problem was, honeymooners were out in full force and there was no room on the clothed side. With an aire of excitement and perhaps slight apprehension, they checked-in to the naked side....and not only LOVED IT, but also took advantage of its freedoms. Every few nights around the bar we'd hear comments like "weird, i saw that person naked today, now we're sitting across from each other at the bar"--which I would assume would be a typical response for a first-time nakation-er. 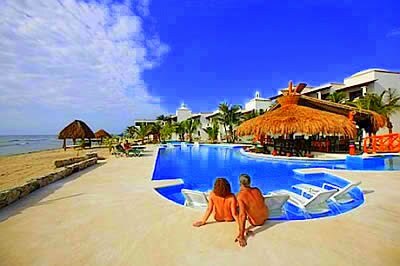 Nudist and Clothing-Optional Resorts Here's a link to Nudist and Clothing-Optional Resorts in the Caribbean. My only question is, what does one do about sunscreen on their nether-regions? Newer PostFlight Attendants or Safety Attendants?